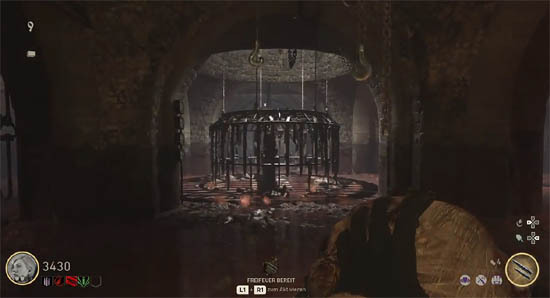 The COD WW2 "Final Reich" zombies map contains an extensive Easter Egg that has players exploring the mysteries of necromancy and searching for Barbarossa's lost treasures. The hunt concludes with players saving Klaus and the Dark Reunion achievement being earned. In this guide you'll find a detailed walkthrough for all of the Easter Egg steps, together with maps, screenshots and puzzle solutions along the way. In order to fulfill the main Easter Egg, players need to find 10 secret items to complete the right hand side of the inventory screen. These include ancient relics or artifacts, such as Barbarossa's sword, that all play a part in saving Klaus from the evil of the Final Reich. These items are not just simple collectibles, but rather rewards for puzzles, riddles and tasks which must be completed in a certain way. It's your typical EE hunt! We know from the backstory alone that the enemy has been researching necromancy and the legend of King Barbarossa, not to mention his many treasures. The legend tells of a sleeping hero, much like the legend of Arthur, who is not dead but asleep with his knights in the mountain. When the ravens cease to fly around the mountain, Barbarossa will awake and restore Germany to its ancient greatness. 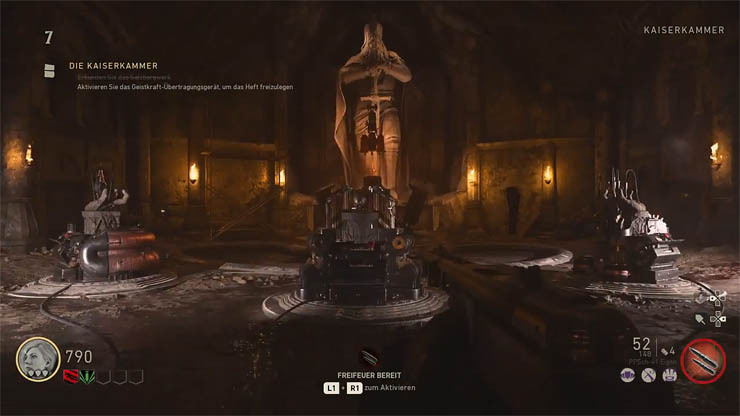 It is rumored that the salt mines chamber in The Final Reich map contains a device to resurrect the ancient body of Barbarossa. Indeed we see a carved statue of a knight standing in front of the Godly devices as if he's waiting for something. Time will tell but the Panzermorder BOSS fight may be only half the story and a real necromancy BOSS fight against Barbarossa's spirit may be waiting for us! The reward for this EE is the Dark Reunion achievement and like in Infinity Ward zombies, a new character is also unlocked at the end. Take a look at the character selection screen and you'll see that there are four unlocked characters and 6 who are locked (with ? symbols next to their silhouette). 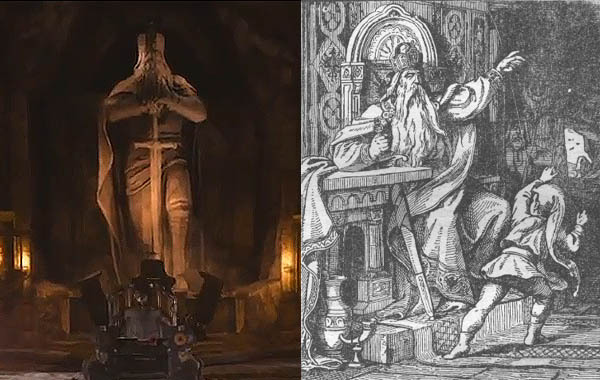 As things stand, we know that Klaus is an unlockable character in The Final Reich but others may be related to future DLC zombies maps. Keeping with the tradition of all my other Easter Egg guides, I like to give players a heads up as to whether the EE is possible SOLO or not. I can confirm that ALL of the steps are possible SOLO. If you are attempting the hunt by yourself then I strongly recommend using the Camouflage specialist to buy some quiet time when needed. The first step for the main easter egg is more of a step-up process, completing the early quests and objectives. These will unlock the majority of the map including the sewer, bunker, lab and salt mines. In addition you will turn on the power and even build the Tesla Wonder Weapon. During the early game, you should also unlock the PaP machine as you will certainly need it later. See the other PaP guide for more details on this. I won't go into detail on completing the individual quests here, instead check the quests guide. Important: Work your way up until the Hilt quest BUT whatever you do, do not shoot or pick up Barbarossa's sword from the Emperors chamber. This starts the BOSS fight where Klaus is killed, ending your chance of rescuing Klaus. Spread around the above ground portion of the map (mostly in the Village) there are coloured spinning tops which are missing from the toy shop window. Check near to window ledges, rooftops and other high up locations. Shoot each of the coloured tops to shoot them down, before picking them up. Return to the toy shop window (besides the bunker door) and place the three tops in the window. Search all of the windows in the surrounding village area, looking for the Enigma machine. It's got a bright bow on the front (orange, green or red) and is easy to spot. Take note of the bow colour and the number on the front of the machine. For example, in the image above the bow is red and the number is 7. So we return to the shop window and turn the red dial so it points to 7 (7 o'clock). We can then work out the other dials by trial and error. Simply turn the orange dial once, then turn the green one all the way round. Repeat again, turn orange once, then turn green all the way round. Eventually you will receive a music disc reward. Take the music disc reward which comes out of the shop window. Players must upgrade all variants of the Tesla Wonder Weapon. The upgrade variants are: Midnight (Green), Bloodthirst (Red), Reaper (Yellow) and Hurricane (Purple). Each of the upgrades appears in the right hand side of the players inventory screen, in the row of four slots. See the Tesla upgrade guide for details on obtaining all of the upgrades. Head to the Riverside area and look for the weather vane device, perched on top of a brick wall. This "chicken" themed device would typically detect the wind direction but in this map we can spin it. Simpy interact to spin the chicken and take note of the directon it's facing afterwards. Use a scoped weapon such as sniper rifle to zoom into the direction the chicken is pointing. Look for the yellow glow (button) and shoot it. It should disappear if done correctly and the waterwheel will turn. Head down to the Riverside portion of the map. Venture down the side path to the actual river and waterwheel. There are two bombs inside the wheel, shoot the bombs with an upgraded Tesla (any variant) and they should explode. Before you attempt this step, ensure you have inserted the record (music disc) into the gramophone in the Pub. For this next part we're going to turn off the power to the Command Room so that the lights turn off temporarily. Make sure you have the flamer zombies head (Brenner Head) close by because you'll need to scan something in a moment. These heads are dropped when killing flamer zombies. First go to the power stations in Morgue and the Lab and change their lights back to green. Then go to the Command Room and hit the new switch on the right side of the salt mine doors. A panel opens revealing some Tesla coils. Shoot the Tesla Coils shown on the left side of the image above with an upgraded Tesla gun, they're near to the pyramid device (you can only do this once per round). The lights will turn off temporarily, head into the passageways for the Lab and Morgue and check the newly opened panels on the wall, shown on the right side of the image above. They are immediately on your left side as you pass through the doors for the Lab and Morgue. Make sure you scan BOTH panels with the zombies head and then wait 10-15 seconds for the lights to come back on. The panels should stay open now. Now spin the numbers one by one, until each letter goes bright blue. You do NOT have to use the zombie head scanner to do this. Keep spinning until the whole line of numbers is blue. A new part should appear from each of the panels which appears to two halves of a cracked coin. Collect both pieces, results in the coin item appearing in your inventory. Now the fun really begins. Return to the salt mines Emperor's chamber and interact with the base of the statue. A brand new ancient sword is now yours to enjoy and the missing slot on the right side of the inventory is now filled. Return to the gramophone location in the Pub and make sure the music disc is inserted and playing music. Now get sword kills in close proximity (very close) to collect zombie souls. The red electric spark will appear if you're killing zombies close enough. Get enough kills until the red sparks stop. Roughly speaking it will take between 25-50 kills depending how many players are in the game. Eventually the song will change and start playing backwards - at this point the job is done. This is probably the most obscure step of the Easter Egg. Now that the gramophone has been charged and the music is playing backwards, a secret code is being played through the music. Stand beside the gramophone and listen very carefully for a clicking sound, a gap, a clicking sound, a gap...repeated. These groups of clicks are your new code. So if the gramophone clicks 5 times, then 4, then 3, then 1. Your new code is 5, 4, 3, 1. Return to the Emperors chamber in the salt mines and use the Voice of God device (middle pillar) to enter the new number sequence, like you did for the original Voice of God quest. Make sure you enter the numbers in a clockwise direction. Once all of the numbers are set, interact with the button on the side to confirm the sequence. If done correctly your character will say "The sounds....they're getting louder". If done incorrectly the message "Machine resetting" appears. Return to Barbarossas statue in the Emperor's Chamber and take note of the circular candles on the ceiling, above the statue. Using ALL four upgraded Tesla weapons shoot the candles by aiming for the outer metal ring of the chandelier. The Tesla charge must conduct through the outer rim. Of course, if playing SOLO, shoot each upgraded Tesla weapon one at a time. If done correctly, the entire chandelier with glow brightly and the Rabenherz crystal will drop, completing the final missing item in the right side of your inventory. Congratulations, you're now ready to defeat the final BOSS! Again, like with the casual Easter Egg, shoot the glowing Hilt and attempt to pick it up. 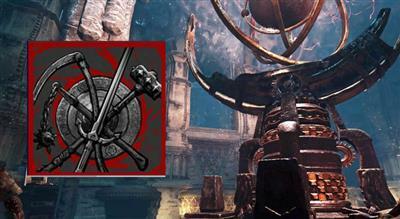 Congratulations you have now beaten the main Easter Egg and earned the Dark Reunion achivement! The second ending cutscene now plays and Klaus has been saved from The Final Reich. Interestingly, Klaus continues to walk around the map with a mysterious red glow around him! The Easter Egg hunt is now complete but this guide will be corrected for the next few hours to provide a precise walkthrough.